[Jesus said,] "The Father and I are one." Once again the people picked up stones to kill him. Jesus said, "At my Father's direction I have done many good works. For which one are you going to stone me?" 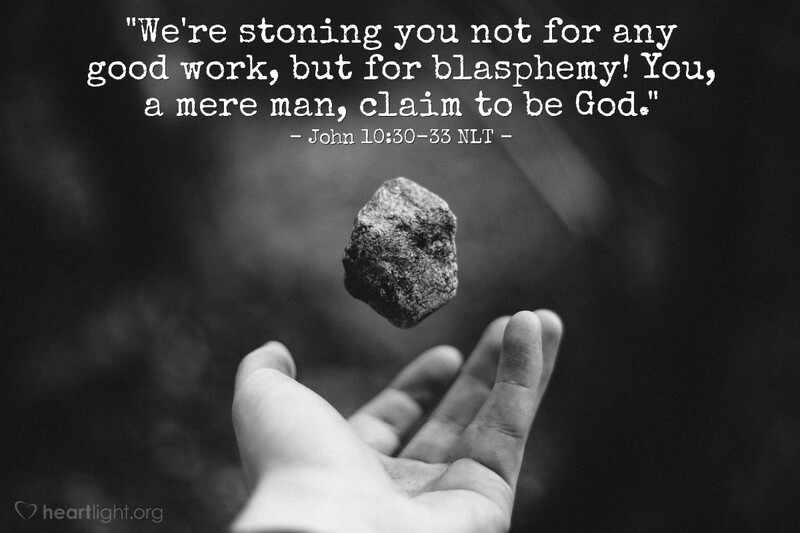 They replied, "We're stoning you not for any good work, but for blasphemy! You, a mere man, claim to be God." They're getting the message! The "I AM" statements, the great deeds of Jesus, and his self-identification as God's Son were understood by Jesus' opponents. He is claiming to be God in human flesh, God among humans, God with us. Either they had to receive him or reject him. They had to obey him or oppose him. They had to believe him or berate him. As so often happens, Jesus' words and actions in John make clear that there can be no middle ground. The same is true for us. Jesus must be our Lord, or he is nothing to us at all. He comes and challenges us to a radical faith in him. Give me courage, great God and Father, to live with Jesus as my Lord. Keep me from lukewarm faith and shallow discipleship. Do what it takes to fan into flame the faith I have in Jesus and make it burn brightly for your glory and for the sake of the Gospel. In Jesus' name, I pray. Amen.